The 1990s were a good time for science fiction magazines with several new launches, on both sides of the Atlantic, which upset the complacent status quo of Starlog and Starburst. 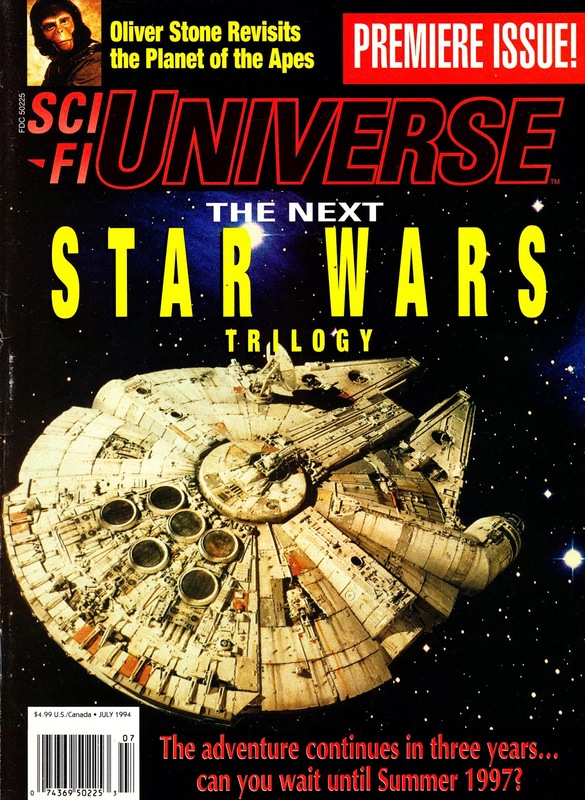 The best to emerge from the States was SCI-FI UNIVERSE, a glossy monthly, enited by Mark Altman, with a more independent attitude compared with "the 'log". Apparently, his less than sycophantic coverage of the TREK franchise burnt bridges with the Paramount production teams. But… he was right… VOYAGER was pretty wretched. I loved this first issue, published July 1994, because it had a serious and detailed look at PLANET OF THE APES. It seems unbelievable now (especially after the 2001 movie - which replaced the Oliver Stone version mooted here - spawned a number of behind-the-scenes books) but there was scant coverage of the original Apes saga when this was published. It's a simple but iconic cover image as well. Incidentally, the "sci-fi" part of the title was demanded by the publisher because they were concerned it might be mistaken for an astronomy magazine. The Altman-era eventually wrapped when the title was sold and became allied with the Sci-Fi Channel. Things were never the same.